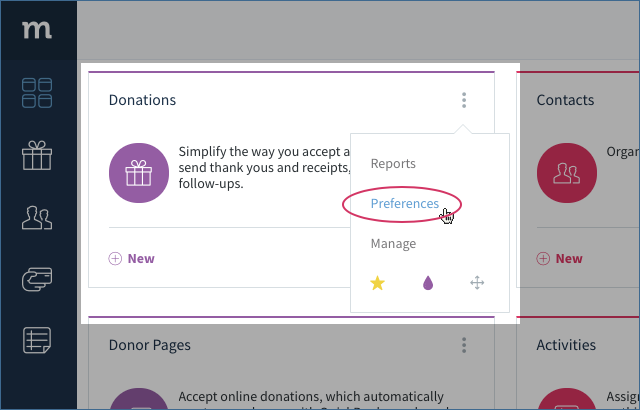 The Donations Preferences screen can be accessed by clicking the vertical ellipses (⋮) on your Donations App and selecting Preferences. This will bring up the Donation Preferences screen. Note, these preferences must be set up before using the app. The screen has four sections, each of which pertains to a different set of preferences. 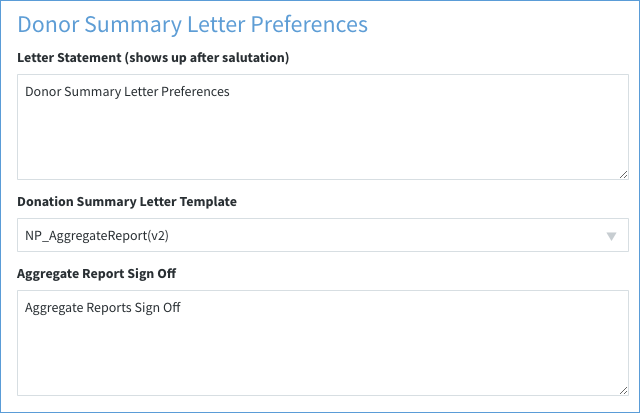 Selecting a blue title expands the section to configure. 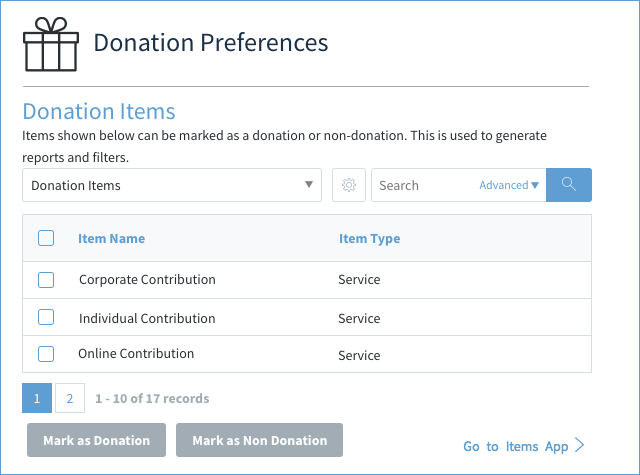 The Donation Items section allows you to mark your QuickBooks items as either Donation or Non-Donation Items. This affects what items are visible in the Item dropdown when you're logging a donation. The item list shows all your QuickBooks items, all marked as Donation Items by default. To remove QuickBooks items from your Donation Items list, check them off and click Mark as Non Donation. This hides them from the items dropdown in the Donations App. To create a new item, click Go To Items App to open the Items App. New items are automatically marked as a Donation Items. For more information on creating items, see our article Creating an Item. 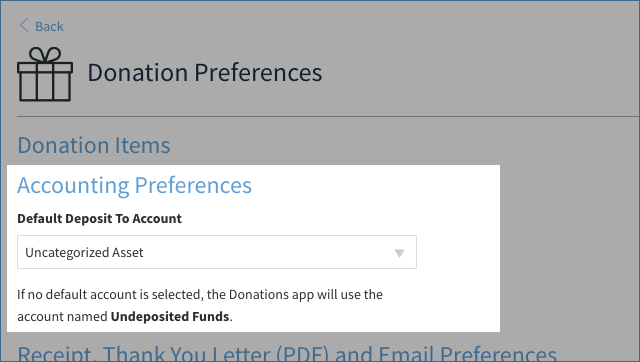 The Accounting Preferences section identifies the account you use to accept donations. If you do not select a default account, Method uses the default Undeposited Funds. The first part of this three-part section allows you to set up your template for a PDF receipt. Donation Receipt Print (PDF) Template: By default we have included the template NP_DonationReceipt. You can make changes to the text of the receipt statement right from here. Federal Identification Number: Enter in if applicable. Receipt Statement: The receipt statement contains legal information that might change depending on your geographic area, so ensure you check with your accountant before making changes to this text. If you wish to create your own template from scratch, you can do so using Method's Report Designer tool, but please note this is an advanced Method tool not recommended for beginners. The thank you letter is also a PDF template meant to be printed and mailed. 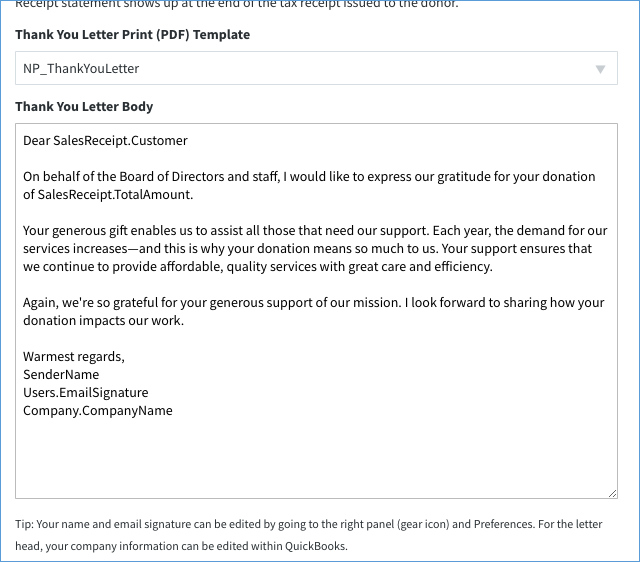 By default we have included the template NP_ThankYouLetter. 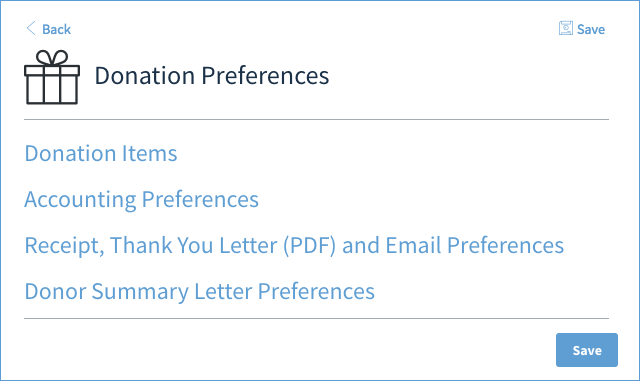 You can make changes to the text of the Thank You Letter right from here, including mail merge fields. Again, you can create brand-new templates using Method's Report Designer tool. 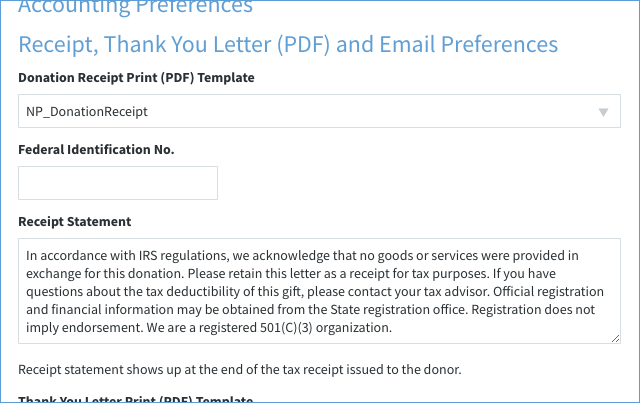 Finally, the receipt email section lets you set up your email template for when you email receipts to donors. This will be the only template used by the Donations App when emailing receipts to donors. 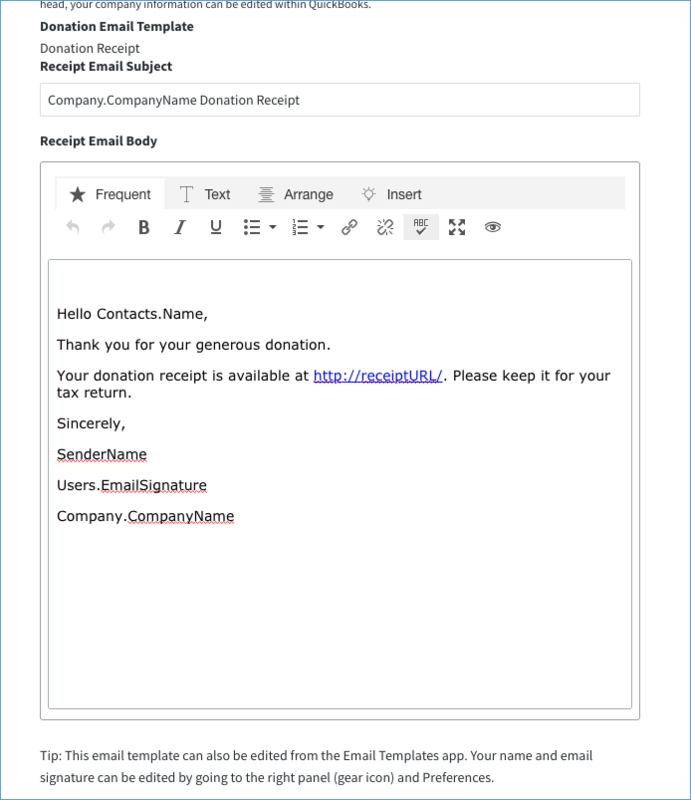 You can change the text and the mail merge fields here, and you can also access and edit this template in the Send Email App. If you want to change your name an email signature, you can do so in your User Prefences. Method pulls your company information from QuickBooks, so any changes to company info must be made in QuickBooks. Your company information is updated in Method after the next sync. If you choose to alter the template, do not change the donation receipt URL. This is the link pictured above and colored blue "http://receiptURL/". If you alter the URL, the link will not work and your donor will be unable to get their receipt. These preferences reflect the messaging on aggregate reports sent to donors who have donated multiple times in a given time period. In addition to the report itself, a statement and sign-off are included on the letter. When you are finished setting up your preferences, click Save.